If you are building a new house, there is no doubt you’ll spend some time making decisions about the type of light and fixtures you’ll want both inside and outside your home. If you are buying pre-drawn house plans like those found at The House Plan Shop, be aware that MOST, but not ALL of these construction drawings will come with a basic electrical plan reflecting the locations of fixtures, outlets and switches. It will be up to the electrician to run the wiring and install the fixtures, outlets and switches according to local electrical codes. However, you are not limited to what the floor plan suggests or recommends. As the home owner, you will work out all lighting selections with your builder and electrician. Take some time to review the different types of lighting fixtures you may need to include in your new home. Outdoor Lighting Fixtures: Proper outdoor lighting achieves two goals, safety and aesthetic beauty. Your choices and placement of outdoor lighting fixtures is the most important aspect in creating an outdoor lighting plan. They enhance safety and security, as well as, the outdoor appearance/nighttime curb appeal of your home. For safety and security, use lighting at all doorways including the garage doors, front and rear porches, sliding doors for the deck or walkout basement and any other service doors. Be sure to light pathways such as sidewalks, porches and patios. Some good choices include motion lights and dusk-to-dawn fixtures so you don’t have to remember to turn them on or off. They simply light the way when necessary. For aesthetic appeal, choose lighting fixtures that blend with the architectural style of your home. Strategically place the fixtures to illuminate special exterior features of your home such as the decorative detailing of the façade or a dramatic roofline. Landscape Lighting Fixtures: Just like outdoor lighting, landscape lighting enhances the aesthetic beauty of the home and increases security, but it also highlights the surrounding plantings and shrubbery that dress up the home’s exterior and yard. It will have a major effect on the overall appearance of your home when used to highlight architectural features and scenery. Furthermore, with the growing trend of families entertaining outdoors, it sets the mood and adds to the atmosphere of your outdoor entertainment space from the deck or screened porch to the patio or lanai. 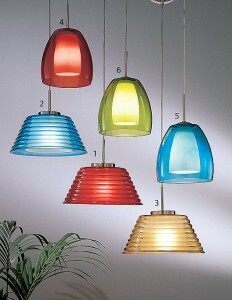 Interior Lighting Fixtures: Your interior lighting plan will cover a broad range of fixtures, styles and purposes. Certain rooms in your new house may require very specific types of lighting. For instance, in many homes the kitchen is a hub of activity handling everything from preparing meals and informal dining to serving as workspace, homework and computer center, and a place for casual conversation. Your kitchen lighting must reflect your lifestyle and the activities that take place in this multi-functional space. Consider task lighting positioned above major work areas such as the meal-prep island, sink and built-in computer desk. Use under-cabinet lighting to illuminate countertops. No matter how many different types of lighting fixtures you need, it is necessary to choose functional and safe lighting in the kitchen. The gathering places are another space that you’ll want to consider multiple types of lighting fixtures. Perhaps a fixture with a ceiling fan centered above the great room will illuminate the space and offer circulation. Consider lamps on end tables near the sofas or the recliner for reading. Choose a decorative fixture for illuminating artwork to highlight your favorite painting or the family portrait above the fireplace. There are a multitude of fixtures for illuminating an entire room such as the dining room while providing an elegant look. Consider a decorative chandelier large enough to light the entire room. Add a dimmer switch here to set the mood for different occasions with various levels of light. Recessed lighting also works well for an entire room, plus it is usually easy to install. It can also be controlled with a dimmer switch depending on the occasion or need for lighting. Bathroom lighting requires a combination of fixtures used in the right places. It is necessary to achieve bright light for styling hair, applying make-up in shaving while not overdoing the brightness as to create a relaxing atmosphere for a soothing soak in the spa tub. Be sure that pathways, entries and hallways have proper lighting, making it easy for the entire family to move about the home day or night with a sure step. Consider an overhead fixture centrally located in the bedrooms with a bedside lamp on the nightstand and maybe a desk lamp if the children do homework in their bedrooms. The garage, craft room, laundry room and workspaces such as a workshop require bright task lighting. Fluorescent lighting such as shop light fixtures are practical in these spaces. Recessed lighting can be used throughout the home. It creates a dramatic effect in many rooms while being versatile enough to satisfy a variety of needs. Finally, don’t forget mini nightlights in the kids’ rooms, the bathroom, staircases and hallways lighting dark rooms and spaces through the night and offering safety for everyone. Before you begin buying light fixtures, take some time to talk with your builder and electrician. Come up with a comprehensive lighting plan that will accommodate your needs, provide safety and work well with your architectural style and decorating themes. For more information, please review “Light It Up” in The House Plan Shop’s resource section.